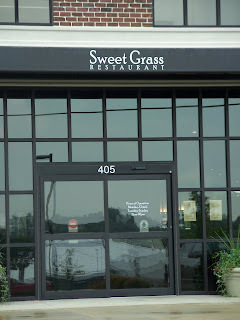 Bloomington's newest restaurant is Sweet Grass. Located on the corner of Rogers and Patterson (right next door to Angel B's - A Galleria of Cakes), this new offering to Bloomington's dining scene is causing quite a lot of interest. The food at Sweet Grass is inspired by Carolina cuisine. The chef/owner spent time in both Charlotte North Carolina and Charleston South Carolina perfecting his skills. The lunch menu features classic Carolina dishes such as shrimp po boys, pimento cheese sandwiches and fried green tomatoes (excellent!). Daily soup specials are priced at $3 and $5 for a cup or bowl. Sandwiches and salads are generally priced between $6.00 and $10.99. Wines by the glass start off at an incredibly affordable $4.50 for Butterfield Station Chardonnay. The dinner menu features starters like: Stuffed Portobello with arugula, caramelized onions and melted mozzarella for $8; Pizzas with applewood bacon and shrimp for $7 and of course Fried Green Tomatoes for $7. Entrees are priced from $13 for a Vegetable Ziti to $18 for a Flat Iron Steak. Or you can go for the dinner sandwiches priced from $9. Additional dinner entrees include: Roast Chicken with a roasted pepper cream sauce; Citrus Glazed Salmon; Brined Roast Pork Tenderloin and the classic southern dish Shrimp and Grits.